A look at AA.com will lead you to believe that there aren’t many bonus AAdvantage miles offers for car rentals (there are just two listed) but the reality is that there are still several active offers. Here’s a list of all the current promotions. Offer: Earn 4x the miles per $1 spent (instead of the usual 1 mile per $1 spent) plus, save up to 35% when you rent any vehicle for one of more days in the US, Puerto Rico, Canada, Belgium, Czech Republic, France, Germany, Italy, Luxembourg, Netherlands, Slovakia, Spain, Switzerland, and United Kingdom through September 30, 2012. Go Gold for Free — No $60 Membership Fee Through September 30, 2012! Stop waiting in lines and filling out paperwork and start earning points for free rentals. With our Hertz Gold service and Hertz Gold Plus Rewards, booking a car has never been easier or more rewarding. Speedier Service: No more waiting at the counter. Just pick up your keys and go! More rewarding: Earn one Hertz Gold Plus Rewards point for every qualifying dollar* spent plus bonuses. Faster return: Just fill out a slip. Leave the car, and you’re off. It’s that easy. Mobile Gold Alerts: Know which car you’ll be driving and where it’s parked the minute it’s assigned. Offer expires September 30. Go here to sign up for Hertz Gold Plus Status or to review the complete terms and conditions. Here’s an offer that’s a better deal if you’re renting 3 or more days. I saw the offer posted at an Admirals Club, but the fine print doesn’t mention club membership as a requirement. Save up to 30% and earn 1000 American Airlines AAdvantage miles with a three day minimum rental on any size vehicle at participating Alamo locations in the United States and Canada. Offer valid through December 31, 2012. Book online at alamo.com or call 1-800-462-5266. Please request I.D. Number 7015732. 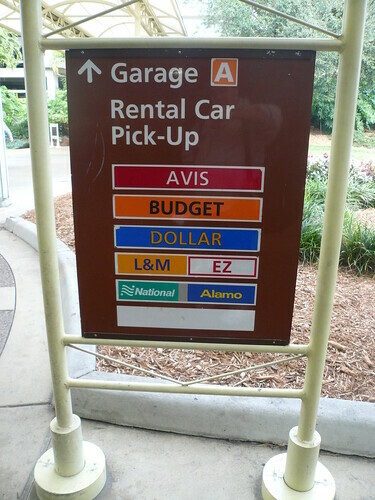 Be sure to provide your American Airlines AAdvantage number at the time of rental. You can save an extra $15 if you use Coupon Code: AD7428SDR (24 hour advance reservation required). You’ll find complete terms and conditions here. I like their online booking engine, it beat all challenges for a rental I had in Cancun.